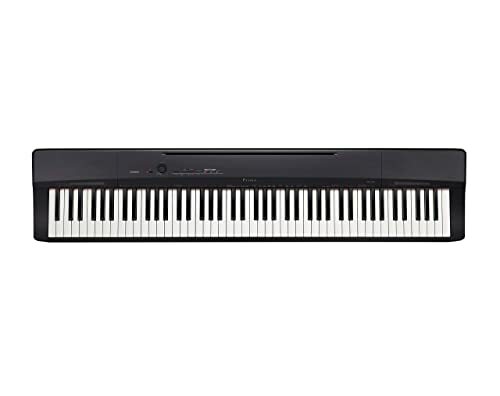 Looking for the best digital piano with weighted keys? Makes sense. There are plenty of benefits to electing to get a keyboard rather than an acoustic. However, if you are going to go the keyboard route, there are features that you need to look out for. One of the most important of these features is weighted keys. However, it isn’t enough to know that you want weighted keys. If that is your only criteria, you will be overwhelmed by the options. You also need to be able to tell the good keyboards from the bad. To that end, we can be of help. Read on for a guide to the ten best keyboards with weighted keys! We’ll start with one of the best on our list. 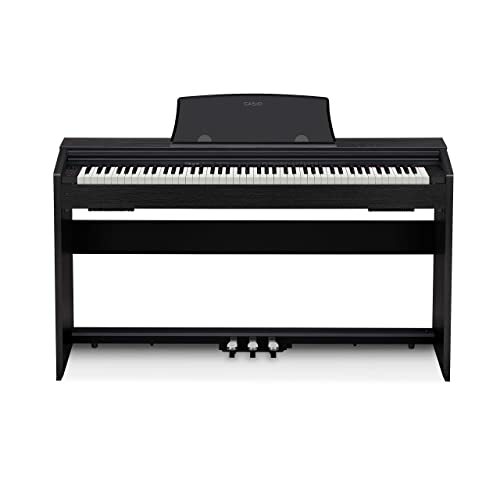 The Casio PX770 is a high-end furniture quality set available at an affordable price. 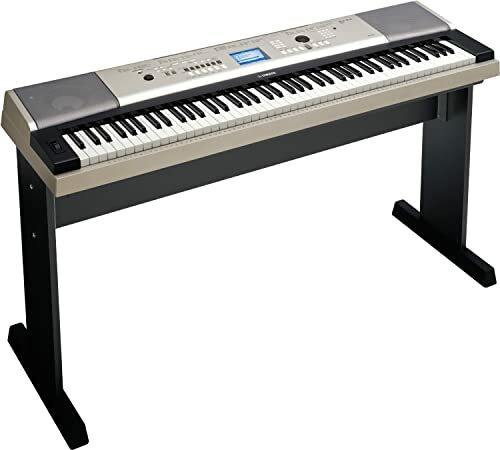 Of course, you get the high-end weighted keyboard that is a standard feature of all of today’s pianos. Casio takes things a step further with tri-sensor technology. The high-quality sensors register even subtle strokes for maximum responsiveness. The set is also pretty comprehensive. You get three pedals, and an ivory inlay on the keyboards. These extra textures will help you play better, and they will better replicate the feel of an acoustic piano. You also get two high-quality speakers, and eighteen different tones for a higher versatility. It is true that there are keyboards out there that do more. 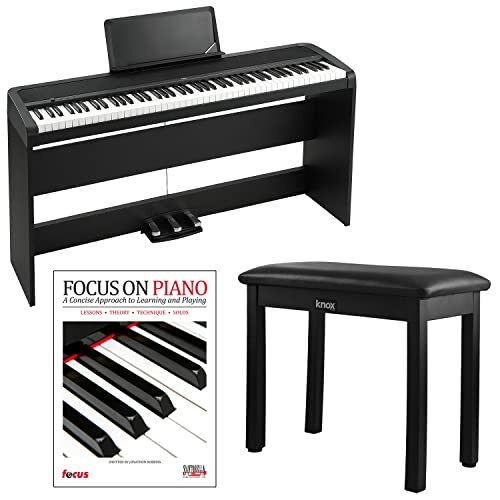 However, for the price, you get everything that you need to play the piano the right way. In terms of issues, we don’t have a lot to report. One issue that we did find was that for faster paced pieces of music, the keys may squeak a little bit. This is actually a fairly common issue with electric keyboards (especially in this price range). Still, it is disappointing to see. That aside, it is a great piano at a very reasonable price. Up next, we have the Korg LP380. This is another furniture set that does everything it can t resemble an acoustic unit. You will find that this piano is substantially more expensive than the last we have seen. However, depending on your needs, you may find that the extra cost is well worth it. One of the first things that you will notice about this unit is the sound quality. The speakers generate a truly robust sound that other digital pianos just won’t match. You also get three pedals, a highly responsive keyboard, and a MIDI capability that makes it easy to edit and upload your music. Digital recording and editing are actually one of the big benefits of going with a keyboard. Most are capable of it to some extent, but the Korg makes things about as easy as possible. All good stuff, right? The big problem that we found was with the sound on high. For regular purposes, a standard sound setting is going to work out just fine. However, when you play at higher volumes, the sound tends to get distorted a little bit. If you are looking for the most authentic sound you can get, this is going to be a problem for you. Otherwise, it is a good piano that will suit the needs of most. Next, we have another unit from Korg. The B1SP is, on the surface fairly similar to the last that we saw. One benefit for budget buyers is that it comes in at half the cost. The aesthetics are really what make this unit similar to the last option. It is an attractive furniture piece that features three pedals. You get 120-notes of polyphony, which produces a rich layered sound quality that resembles an acoustic unit. You also get eight different tones here, including three acoustic piano flavors, and organ, and two electric keyboards. The big difference here is that this unit is a little bit simpler than the last that we saw. You don’t get the same high-end recording interface. It’s also not quite as well equipped in the sound department. Of course, these are things that you might expect to encounter in a piano of this price range. One thing we noticed was that the housing is a little bit fragile. The furniture stand looks nice, but it is prone to some wear and tear. This is also an issue that is common to pianos of the price range. However, it is something pet owners and parents will want to take note of. Up next we have a piano from Yamaha. This unit features a semi-furniture stand. This means that it will have décor value, but that it is also mostly designed with function in mind. This is actually a pretty simple keyboard, but there are benefits that come from simplicity. This is actually the most affordable option that we have seen so far. If you are a budget buyer, you are going to want to pay attention here. You don’t get lots of superfluous features here. But what you do get works well. Yamaha engineers most of their keyboards to replicate the sound of their best grand pianos. We see that refined sound engineering in this unit. You also get a high-quality keyboard interface that will replicate the real thing. 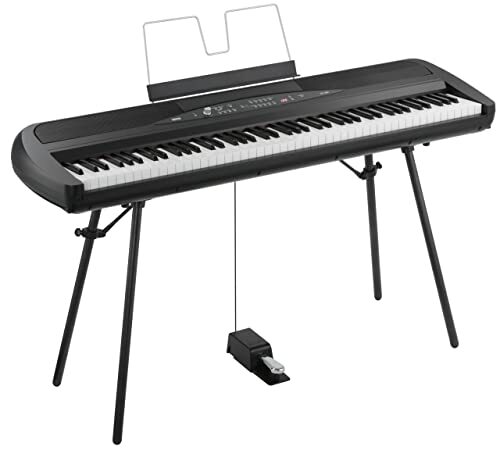 Finally, the keyboard features a USB port that makes recording music pretty straightforward. Just keep in mind that the speaker quality isn’t quite as high as you will see with some of the other options. You will also need to buy pedals separately. Let’s now look at the Kawai ES110. This moderately priced piano features an incredibly rich sound quality, enhanced by 192 notes of polyphony. You also get eighteen different sounds for a wider variety of playing options. This includes eight different piano tones. One of the biggest draws that you get with this unit is the Bluetooth MIDI capability. Through built in Bluetooth sensors you are going to be able to record music easier than ever. You can then edit and alter it from a computer at your convenience. It is also worth mentioning that you get high-quality furniture stand here, complete with three pedals. Is this the most advanced piano that we have seen so far? Not quite, but for the money you do get plenty. One issue that we did notice is that the keys are weighted, but not graded. This means that they’ll feel more or less the same, as opposed to an acoustic piano where the weight varies. Next, we have the P125. This keyboard is moderately priced but bare bones in terms of what you get in the package. If you want a stand and pedals, you will need to buy them separately, which will quickly ramp up the costs. The minimalist, compact design will, however, be of benefit to users with limited space. The keyboard can easily be used tabletop on a desk or table. And despite the minimalism, you do get a good keyboard here. Like the last Yamaha that we looked at, you get a sound engine that is made to imitate a grand piano. You also get a high quality, very responsive keyboard that will closely imitate the performance of the real thing. Last but not least, it is also MIDI capable. All you need for high-quality sound recording is a USB port. We did however find an issue with the keys. Though they are weighted and very responsive, they do have a plastic feel to them that may be distracting. The William Rhapsody 2 features an elegant wood like finish, and a refined sound quality. Both features that will serve to make it closely resemble an acoustic piano. You also get twelve different sound options including several different piano tones. This is another option that manages to be simple but impressive. There aren’t lots of bells and whistles here. 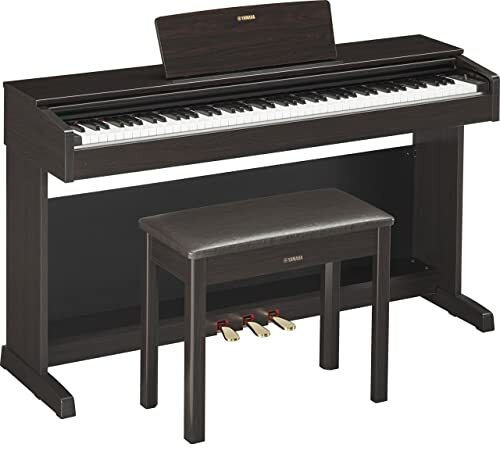 What you do get is an affordable piano that will occupy a large presence in your home. It will accomplish this both through its elegant design, and its high quality sound. The real issue is simply that this doesn’t stand tall next to some of the higher end options we have seen. For buying on a budget it is great. However, if you want high-quality recording options, or the richest sound you can get, you will need to keep looking. Let’s now hop on over to the higher end of the price spectrum as we look at this Yamaha. The YDP143R is an elegant furniture piece with a nice rosewood finish. This piano is pricey, but it gives you plenty for your money. Three pedals, fifty songs, and their grand piano sound engine. You also get an onboard recording mechanism, and a phone app to help navigate it. To sweeten the pot, it even features a play along mode that will help to teach beginners the pre-programmed songs. 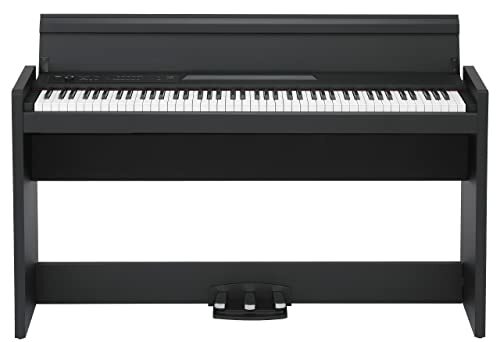 The wide range of features means it will suit beginners and experienced pianists alike. The only real issue that we noticed was in regards to the furniture stand. The cabinet design itself is sound. We did however find that the hardware is quite flimsy. You can fix this by selecting replacement hardware from the hardware store. However, doing so may be tedious. Penultimately, we will take a look at one final Korg. The SP280BK is quite popular for its array of vintage sounds. It even features a vintage interface to enhance the classic experience. You don’t have to be looking for a throwback to get the most out of this keyboard though. It’s just a good piano. This is a true traveling musician’s keyboard. It features a low profile, foldable stand, a lightweight frame, and a compact design. Its onboard speakers are also powerful enough to fill a small venue. For larger venues, you will of course want to utilize external speakers. You get thirty sound effects here, weighted and grated keys, and a high quality damper pedal. Unfortunately, it does have an Achilles heel. For as good as it is for travel, there is one department in which it is vulnerable. Durability. The keys, and overall casing are very vulnerable to wear and tear. Even a bumpy car ride could be enough to do some damage. Is the high-quality performance worth it? Ultimately, you will need to decide that for yourself. Last, we will look at the Casio PX160BK. This final piano is moderately priced, but includes a slew of high-end features. You get eighteen sounds, scaled and weighted keys, and of course, Casio’s tri-sensor technology. 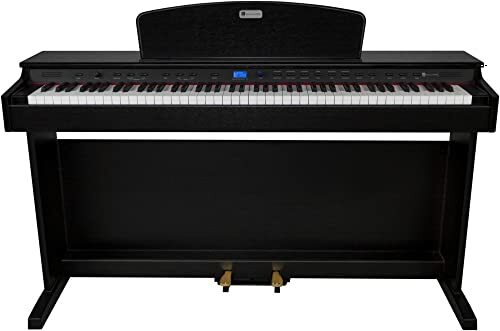 It’s a low profile piano with high-quality onboard speakers and user friendly interface. It also features USB connectivity for digital recording and editing. This isn’t as feature rich as some of the other options we have seen, but the things it does do, it does right. There are problems. The pedal isn’t great, and the texture of the keys is a little bit off. For the money though, the features and performance would be hard to beat. 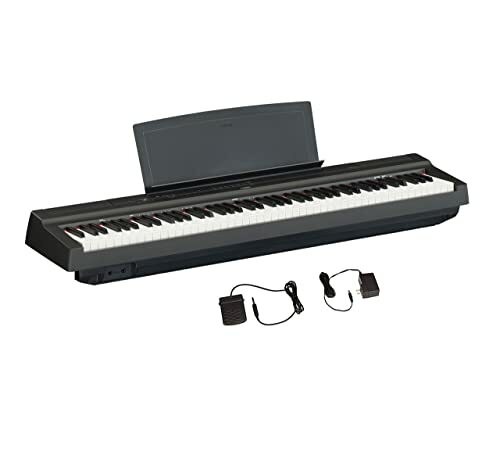 Getting a good electric piano with weighted keys doesn’t need to be difficult. Anyone of the options listed above will do well to satisfy your needs. Whether your budget is big or small, there is something out there that will fill your life with beautiful music. We found the Casio PX770 to be today’s winner. The features, the value, and the performance make it a tough choice to beat. However, if it isn’t for you, that is ok. All of the options we looked at were high-quality. While we can’t tell you which to pick, we can say that if you choose from this list, you won’t be disappointed.